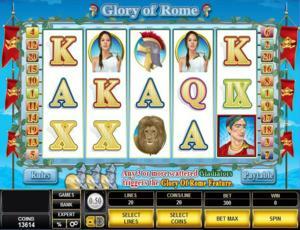 Glory of Rome is an online video slot machine game released in November 2006. It is offered exclusively at online casinos powered by Microgaming. This video slot game has 5 reels and 20 pay lines. The theme of Glory of Rome is inspired by the rich history and culture of Rome, also known as the capital of Italy. For most people, the very first things that come to mind when we talk about Rome are: Julius Caesar, beautiful Roman ladies, and a battle arena with chariots, lions, and gladiators. You get to see all of them and more when you play the Glory of Rome online slot game, which features a fun Bonus Feature game that can reward you with lots of Free Spins! And to lucratively reward you more, all the winning combinations you get during the Free Spins are doubled! Microgaming online slot games are available to players in 2 formats – download and no-download. Whether you like to download their software first or you prefer to play instantly without the need to download, then Microgaming surely has online slot machine games to accommodate your every slot gaming preference. Glory of Rome is a slot game that belongs to the download category, which means you must download first before you are able to play this particular slot game. If you are into Roman history and love to watch Roman-themed movies, then you will surely have a great time playing the Glory of Rome online slot game by Microgaming! The Glory of Rome online video slot game features scatter wins, a Wild symbol, the Glory of Rome Bonus Feature game where you can win Free Spins (multiplier x2 on all winning combinations) and/or bonus prizes, a maximum coin jackpot of 5,000, and a maximum cash jackpot of $50,000! Who would’ve thought that having an interest in Roman history could be this fun and beneficial! The quality of the graphics and sound that Microgaming provides is absolutely fantastic and top notch. They have an impeccable reputation of making the most stunning graphics and true-to-life sound effects that will truly transport you to “that specific theme” they used in any of their slot games. Most people love to play games incorporated with Microgaming software because they have smooth animation and engaging yet non-interfering sounds. In Glory of Rome, you will see an opening short clip of the Glory of Rome who is triumphant in the arena, and as a reward he gets to ask for the hand of the woman whom he loves dearly. The symbols are drawn in a semi-realistic manner, and because they are pastel colored, you will play here for a long time because it will not hurt or strain your eyes. Simple animated programming is used on the symbols when you successfully hit winning combinations. The overall graphic design of Glory of Rome shows the bright blue color of the sky, and on the surrounding of the reels, you will see entwined laurel vines with 3 red war flags on each side of the reels. Beneath the reels, you will see the Rules and Paytable buttons as well as the Gladiator icons reminding you that if you get 3 of them in a winning line, you’ll trigger the Glory of Rome Feature. In Glory of Rome, the background music and sound effects you will hear are very similar to the ones you will find in land-based casinos. Whenever you spin the reels, simple sounds common in land-based traditional slot games will be heard. When you form winning combinations, trumpets and the cheering sound from the crowd will fill your ears. The card deck symbols available in the Glory of Rome online video slot game are IX, X, J, Q, K, and Ace. The regular symbols that you will find in Glory of Rome are the Roman Lady, Chariot, Lion, and Helmet. The Wild Symbol is Caesar. It acts as a substitute for all other symbols (except for the scatter symbol) in order to help you complete a winning combination. You will be paid out varying prizes (please see the payout table) when you manage to form winning combinations with multiple Caesar wild symbols on an enabled pay line. The Scatter Symbol is the Gladiator. The scatter symbol is not required to appear in a line (on an enabled pay line) for you to win. The Gladiator scatter symbol can be found scattered anywhere on the 5 reels, and you are able to form winning combinations as long as there are 2 or more Gladiator scatter symbols that appear. Your winnings are calculated by multiplying the Gladiator scatter symbol combination payout (refer to the Payout table) by the total number of coins you’ve bet. If you manage to get 3 or more Gladiator scatter symbols, you will trigger the Glory of Rome Bonus Feature game. Please take note that if you get a scatter win and a regular win, then you are paid out for both of these wins, because the Gladiator scatter symbol is not required to come out on an enabled pay line for you to win. Scatter awards are independent from pay line awards, and thus they are added to the pay line win. Glory of Rome Bonus Feature Game – If you manage to get 3 or more Gladiator scatter symbols anywhere on the 5 reels, you will activate the Glory of Rome Bonus Feature game. You will be initially given 8 Free Spins. There will be 9 shields presented to you. You are allowed to select 4 shields that can either reward you with random amounts of bonus prizes or extra Free Spins. All of the winnings you get are accumulated in your bonus pot. Once you are done with your selection, the Free Spins will automatically be played out. All of the winning combinations you form during the Free Spins will be doubled! You cannot activate the Glory of Rome Bonus Feature game again while playing the Free Spin Bonus Feature game. You also cannot win extra Free Spins once the Free Spins are played out. Please note that since the Gladiator symbol is a scatter symbol, your winnings are calculated by multiplying the Gladiator scatter symbol combination payout (refer to the Payout table) by the total number of coins you’ve bet. Once the Free Spin Bonus Feature game is over, you will be then taken back to the main Glory of Rome online slot game, and your winnings from the Free Spin games will be included to your overall balance. Glory of Rome has 5 reels where you may bet on 20 pay lines. The minimum bet is 0.01 and the maximum bet is 0.50 per pay line. You can wager 1 up to 20 coins per pay line bet. Therefore, the maximum bet amount is 200.00 per spin. The maximum payout in the standard Glory of Rome online video slot game is 5,000 coins per line bet. People who regularly play online casino games naturally love to stay longer on online slot games that have an Autoplay function. Good thing that Glory of Rome is equipped with this function! In Microgaming online slot games, they have 2 game modes – Regular mode and Expert mode. You can have the game spin automatically for you with the Autoplay function that can be found by clicking the Expert button (located at the lower left portion of the game screen). After customizing the Autoplay function to your preferences, just click on the Start button, and the game will automatically spin for you while you just sit back, relax, and enjoy playing this ancient Roman-themed online video slot game!